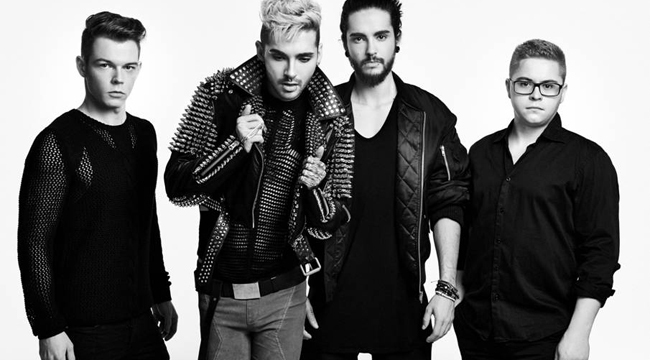 Following the release of last year’s Kings of Surburbia, Tokio Hotel—twin brothers Bill (lead singer) and Tom Kaulitz (guitar, backing vocals), Georg Listing (bass) and Gustav Schafer (drums)—released an EP featuring remixes of “Feel It All” and “Love Who Loves You Back.” The German rock then embarked on a tour in support of the album, which represents a departure because of the way they mix rock and electronic music. Bill phoned us from L.A. to talk about the album and tour. What is it like to prepare for a tour? Did it require a lot of rehearsal? It took forever to perfect the show. We wanted something new and special. The idea is to create a show that’s never been seen in such small venues in club situations. We prepared the show for two months in Germany at the beginning of this year. We hit the road and had the first leg in Europe and we wanted to bring the exact same production to the U.S. It worked out well. It’s the same show. It’s a lot of lights and a super big production. We wanted to turn the live venues into a nightclub and party with everyone and have a big party with costumes. It’s a very electronic show. Talk about the lights and costumes. This time I worked with Marco Marco for the costumes. We went back and forth and I had all the ideas and tried to find the right partner to turn it into a reality. With him, I created the right costume for everything. We had a young guy from Germany who did all the video production and the whole lighting concept. Talk about the band’s origins. The group came together in 2001. What brought you together? Tom and I started super early. We were seven years old when we started to write our own songs and then we met the other two guys about 15 years ago and we have been a band ever since. We had our first No. 1 hit and it’s been a big adventure ever since. What was your Star Search experience like? It was just something to get some attention for the band. Where we come from, there is no music industry. There is no management or producers. It’s not really what I wanted to do but I wanted to get attention for the band and it worked out. Do you feel a kinship to Germany’s pop and rock music past? I really liked Nena. She had that song “99 Luftballoons.” When I was seven, I had all her CDs and cassettes and I saw her concert. I wanted to do the whole thing. I was a massive fan of her. I always loved her and I still think she’s great. Rammstein is great. It isn’t my music but I love their shows and we know them and they’re great guys. I like them a lot. The whole electronic thing just happened for us. We never planned to play more electronic music. It was just a natural thing. For this album, we started to produce everything on our own for the first time. We built a home studio. It just happened to be more electronic and we found our sun. I listen to Madeon and I think he’s fantastic. I saw him at Coachella. This whole album is influenced by the nightlife and the DJ scene in Los Angeles. I know you’ve spent lots of time in Los Angeles. Have you moved there? We were hiding away. We were living in Germany and it became impossible to have any private life beyond the career. We couldn’t go anywhere. We had 24-hour security. We needed to go somewhere to take a break. We moved to L.A. about six years ago just to not do anything and get a break and find inspiration for new music. For a year, we didn’t do anything. We slowly got back into the studio and trying to write songs and make new music. It was a perfect decision for us . . . personally, for us to have private life, and also for the creativity for the band. How different are the clubs in L.A. from the ones in Europe? I feel like it’s so different. The music scene is so different. The whole life in L.A. is so different. It’s a whole different thing, for sure. I do miss Germany sometimes. I miss the German bread and the food, but I love living in L.A. The music scene is massive. There are so many producers and writers you can meet up with and go in the studio with. We’ve taken advantage of that. What was the process of mixing and producing like? It definitely takes longer. That’s why the album took so long. You do think about every single tone on the album. We’re so proud of everything that’s on it. We didn’t want to compromise. That’s how it happened. We were working with producers but when they sent things back, we didn’t like what they did. We felt like no one quite understood what sounds we wanted. We just took it over and did the final mixing and producing. I think we’ll never do it any different. It’s just the way to do it. Thomas is very particular with the sound he wants and it’s the way we’ll do it from now on. My favorite song is “Girl Got a Gun.” Did something specific inspire that song? It’s funny because we wrote it in L.A. a long time ago. We were on the way to a songwriting session and we were looking for a great verse. We came up with that hook. It’s inspired by our life in L.A. I tend to get in trouble and I choose the wrong people in my life. They get you in trouble and you shouldn’t hang out with them but you still do. You have to remind yourself to stay away with them. For me, it’s better if I’m on tour and busy; otherwise I end up getting in trouble. “Run, Run, Run” was also recorded by Kelly Clarkson (featuring John Legend). Have you heard her version? I did. We heard it long before she put it on her record. They sent us a version. It’s so cool. I love the both of them on the track and it sounds great. It’s very different from our version. Ours is very stripped down and her production is a little bigger, but I think it’s great. It’s almost like a whole different track. Have you started thinking about what direction you’ll go in next? I feel like we’re always in the studio when we’re not on the road. We go back and write new stuff and we’re constantly making music. The whole electronic vibe to the song is our sound now. With Kings of Suburbia, we finally have found a sound we like and the sound for the band. That’s what we’ll go for. All the stuff we’ll do is way, way more electronic than what we used to do.